Metanoodle: Mauldin on Men Without Work - an out of the box view. Mauldin on Men Without Work - an out of the box view. Four keys from John Mauldin's March 28th letter and the underlying book being reviewed, "Men Without Work" by Eberstadt. Canada has an advantage. 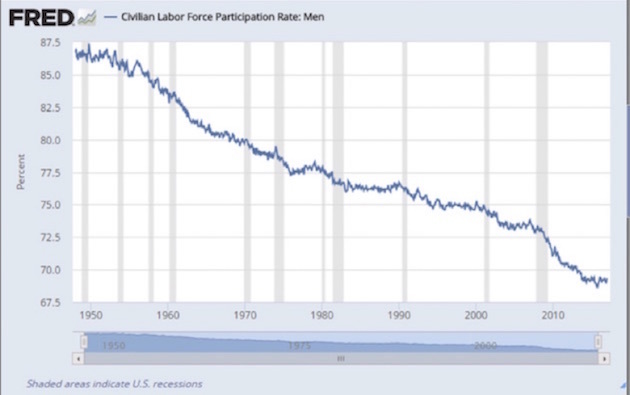 Male participation declining for 60 years. Work age males have been steadily leaving the paid work force for 60 years. Who knew? The loss of male workers was masked by the many females who entered the workforce from 1970 to 2000. 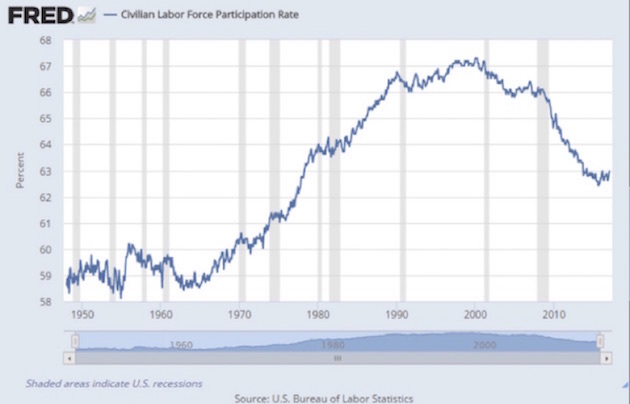 Net participation is on the decline again. 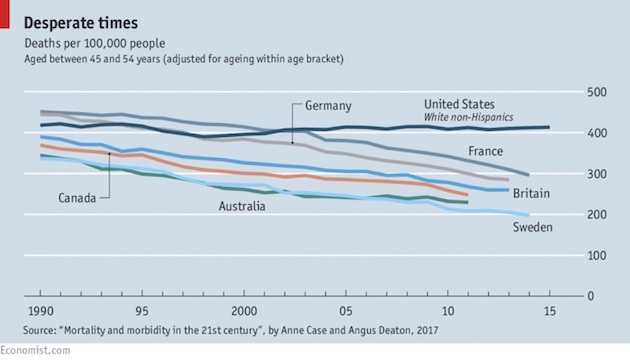 At the same time, life expectancy for white males in the 45-54 (top earning) range has been increasing in most developed countries but has not in the United States. This is noteworthy because Canada next door has not taken part in the U.S. stagnation. The chart is in deaths-per-100,000 people. The U.S.A. has about 20 million people with felony records and more with dismissed felony charges. These are mostly men, their population has quintupled since the sixties thanks to policy change, and they have a hard time getting hired. There is no door back in for them. Lastly, who is most likely to be full-time in the work force? It's not race and education. It's who is married and who is a first generation immigrant. These are the males most likely to be at work this morning. They are the most motivated groups.